It’s that time of year again, as some of you need no reminding. There are schools with stressful, shouty posters saying 20 DAYS TO GCSEs, which is really hardly necessary – and, in my opinion, could well be detrimental. 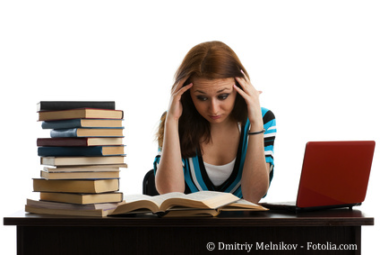 Most students’ stress levels are perfectly high enough. What students and their parents need is calm, knowledgeable advice and genuinely useful tips. And here I am with just that! One of my areas of expertise is how brains learn best and another is the effect of stress on performance, so I’m well-equipped to help. The approaching Easter holidays present the important challenge of balancing revision with relaxation. I’ve written and spoken before about the importance of relaxation to learning – we simply don’t perform as well if we push ourselves in an unhealthy way and many young people will be doing this. It’s a core message in my talks for all ages. You’ll hear my podcast about it here. “Relaxation is not a luxury” is the big thing I learnt the hard way, after many years of stress-related illness and under-performance. A sheet of exam tips – print it, pin to your wall, share it with your friends. A link to the Leckie and Leckie blog, which includes several posts from me with my favourite exam tips. An exam revision time-table for you to download, nicely-designed by one of my publishers, Walker Books, and a more detailed one here, with instructions. I wish you all a smooth passage through this year’s exams. It’s not easy – it’s not supposed to be! And it won’t always go brilliantly, even if you’ve done everything right. But there are always more ways to succeed – you don’t just get one shot and if it doesn’t go as you’d hoped there will always be other ways to have a truly successful and fulfilled life. Good luck and go for it – it will soon be behind you!